Photo: Mulville House, ca. 1931, Mountain Road, Norfolk, CT. Listed on the National Register of Historic Places in 1984. Photographed by User:Magicpiano (own work), 2016, [cc-by-3.0 (creativecommons.org/licenses/by/3.0)], via Wikimedia Commons, accessed December, 2016. County Government in Connecticut was abolished in 1960. The eight counties continue solely as geographical subdivisions of the state. The Town of Litchfield is the historic county seat. The County was organized in 1751 as the fifth county in the State, although it had been settled many years before. Within the bounds of the county are found the highest land, the greatest lake area, the most rugged scenery, and some of the richest agricultural lands of the State. The highest point of land was for a long time a matter of dispute, but that designation is now given to Bear Mountain, in the town of Salisbury. This mountain reaches an elevation of 2355 feet above sea level, and there are a number of other near-by points which come close to the two-thousand mark. While it was at first supposed that Norfolk contained the highest point of land in the county, the topographical surveys made at the instigation of Robbins Battell gave the palm to Bear Mountain. Later Mr. Battell caused to be erected a monument to mark the spot, thus permanently designating the highest point of land in the State. 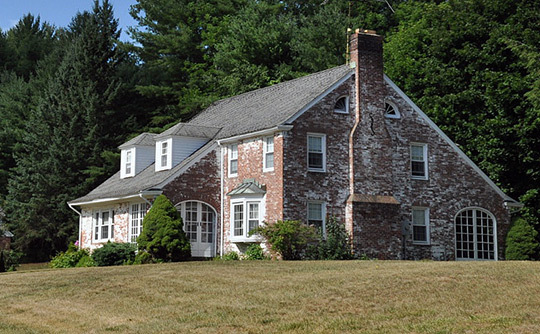 The earliest settlement in Litchfield County was doubtless in the town of Woodbury. There is a tradition of the coming of these pioneers, that they were ordered by Governor Winthrop to follow the Pomperaug River up eight miles from its junction with the Housatonic. But the Pomperaug looked so small that they thought they must be mistaken and kept on until they came to the Shepaug. This they followed up eight miles to what is now known as Roxbury Valley. As this did not quite agree with the description of the land they were seeking, they crossed over the wilderness and discovered from Good Hill the rich valley which was the object of their search. On this hill they kindled the first recorded home camp-fire, and then in the name of God set up their altars. As an expression of gratitude for their safe arrival on the borders of such a rich valley — their "promised land" — a devout deacon of the party "fell on his knees, leading to prayer the little band of hardy adventurers, invoking the blessing of Heaven upon their enterprise, and praying that their posterity might be an upright and godly people to the land." Phelps, Charles Shepherd, Rural Life in Litchfield County, The Litchfield County University Club, Norfolk, 1917.